As magical as the park is during any season of the year, Christmas at Disney World is extra magical. Florida (the “Sunshine State”) usually isn’t synonymous with Christmas, but Disney proves that you don’t need North Pole-like weather to experience the enchantment of the holiday season. Starting in early November, Disney Cast Members begin to dress the park head-to-toe with lights, trees, wreaths, garland, ribbons, and other Christmas-themed topiary. Once all of the decorations are in place after Thanksgiving, the entire park is filled with Christmas trees, festive decorations, and magical Christmas elements in every corner. While each theme park has its own special take on the Christmas theme, certain areas of the park have slightly more sparkle and pageantry than others. In this article, we give you an overview of the festive goings-on at the theme parks and resorts during the Christmas season. We hope this guide will prepare you to experience Disney’s holiday magic to the fullest! Disney’s full Christmas season runs from late November (after Thanksgiving) through the beginning of January. With the exception Christmas week through New Years, Christmas has traditionally been less crowded. With all of the festivities surrounding the holiday season nowadays, Disney World is fairly crowded throughout this stretch. Even though the weather isn’t as nice as other times of the year, don’t expect Disney to be less crowded than June or September (because it won’t be). As far as the best time to visit in terms of crowds, the second week in November tends to be lighter as the park transitions from the Halloween season to the Christmas season. However, not all of the decorations will be up at this time. The Monday following Thanksgiving through the first two weeks in December are probably your best bet because the park is fully decorated and you will beat the school vacation crowds. The third week in December starts to get more crowded, but certainly, the weekend before Christmas through New Years tends to be the most crowded time to visit. Christmas at Disney World is truly a magical time to visit. Just because the holidays are more crowded than they used to be, don’t let the crowds deter you from going during Disney’s most magical time of the year! As you might expect from such an iconic park, Magic Kingdom goes all out for the holiday season. Cast Members decorate every corner, including the shops, restaurants, and even some of the attractions ( for example, Jungle Cruise attraction gets a Christmasy makeover). Main Street U.S.A is decked out with garland and wreaths, and Town Square is home to a spectacular 65-foot foot Christmas tree adorned with thousands of twinkling lights. In fact, Disney labels any tree from 30-feet and up as “icon” trees, with Liberty Square’s tree being one of the crowning jewels. But perhaps the most strikingly decorated feature of Magic Kingdom is Cinderella Castle. With over 300,000 sparkling lights covering its exterior, Cinderella Castle lights up at dusk when Elsa magically transforms it into a winter wonderland for the A Frozen Holiday Wish Show. Every night during the Christmas season, Elsa uses her magic to illuminate Cinderella Castle as part the brief but entertaining A Frozen Holiday Wish Show. Guests are sure to be awed and enchanted as the castle – draped head-to-toe with twinkling icy white lights – is set alight. While the Christmas Day Parade on ABC airs every Christmas Day, the actual taping of the Magic Kingdom segments happens over the course of several days during the earlier part of the Christmas season (November). Be advised that – if you plan on visiting Magic Kingdom prior to the taping of the parade – Liberty Square’s icon tree won’t be up until after the taping occurs. Mickey’s Very Merry Christmas Party is a series of popular events during the holiday season. They are ticketed separately from regular tickets and the events are held several times per week. Each ticket allows you to enter Magic Kingdom during the evening, gives you access to all of the Mickey’s Very Merry Christmas Party events, and gives you entry onto the attractions. Mickey’s Very Merry Christmas Party includes a Character Meet & Greets, Mickey’s Most Merriest Celebration (a singing, dancing show with characters including Mickey, Minnie, Donald, Daisy, Goofy, Pluto, Peter Pan, Alice, and Snow White held on Cinderella Castle forecourt stage), A Totally Tomorrowland Christmas Show (a 20-minute holiday stage performance held near Space Mountain), Mickey’s Once Upon a Christmastime Parade (a festive holiday parade down Main Street U.S.A. (similar to the normal Main Street USA parade but with a lot more holiday cheer), and Holiday Wishes-Celebrate the Spirit of the Season, a fantastic fireworks spectacular at 9:30 pm. And yes, many of Magic Kingdom’s popular attractions are open during the event. Mickey’s Very Merry Christmas Party is a limited-ticket event so you can expect the lines for the rides during the event will be shorter than usual. If there is one Disney theme park that outdoes Magic Kingdom during the Christmas season, it may just be Epcot. The park really goes all-out with events and decorations, with the showpiece being the icon tree located in World Showcase Lagoon (between World Showcase and Future World). The tree is decorated with giant bells, globes, and flags from around the world. Epcot’s holiday celebration is called the Epcot International Festival of the Holidays. The highlights include the Candlelight Processional, Joyful! A Gospel Celebration of the Season, World Showcase Storytellers, a holiday “Peace on Earth” version of IllumiNations: Reflections of Earth. While the holiday decorations of Future World are understated, one standout is the garden areas. Here you will find festive poinsettias and pine trees, Mickey Mouse-shaped shrubbery, and other classy touches. World Showcase is always an interesting place to visit. You can find cultural and culinary aspects of 11 different countries from around the world. But with the added holiday celebrations, this area really takes the enriching cultural experience to a new level. Each of the World Showcase pavilions is decorated to reflect the country it represents. Besides the decorations, Epcot’s International Festival of the Holidays celebration hosts storytellers throughout the holiday season with each pavilion hosting a storyteller who spins tales from their native country. Epcot’s Candlelight Processional has long been a favorite Disney holiday tradition. Starting the Friday after Thanksgiving, this event is held nightly (at 5:00, 6:45, and 8:15) in The America Gardens Theatre and runs through the end of December. Despite hosting nightly three performances, the Candlelight Processional still seeing huge crowds at each performance. One way to guarantee that you will get a good seat is to book a dining package that includes seating for the show. Another option is to wait in the “standby” line in the hopes that you can secure a seat without reserving a dining package. If you do not have any luck with the standby line, you can still see squeeze into the walkway at the back of the theater and (hopefully) see the show that way. Your best bet is really to pay a little more and reserve a dining package for the show. As always, we recommend that you speak with a commission-free Disney Travel Agent to discuss your options. The holiday version of IllumiNations: Reflections of Earth is a short but spectacular holiday fireworks display. It takes place nightly at 9:30 PM (rather than its typical 9:00 PM time) and “Let There Be Peace on Earth” plays in the background as the sky lights up. Tucked behind the Fountain of Nations you will find Joyful! A Gospel Celebration of the Season. As you may have guessed by its name, the show features a powerful gospel celebration to celebrate the holiday season. Joyful! runs a few times daily from the day after Thanksgiving until a few days before the new year. Unfortunately, Hollywood Studios doesn’t have as many events as Magic Kingdom or Epcot. And it isn’t as decorated as those parks either. However, you can find Christmasy elements throughout the park including an icon tree right outside the front gate. In terms of events, Hollywood Studios does have one great Christmas show: the always entertaining Jingle bell, Jingle Bam! show. Jingle Bell, Jingle BAM! was introduced in 2016 as a nighttime holiday spectacular. The show uses fireworks, projections, holiday music, and (artificial) snow to set the scene. It also features holiday clips from the Disney holiday movies Mickey’s Christmas Carol, Pluto’s Christmas Tree, Bambi, Beauty and the Beast, and The Nightmare Before Christmas. In case you recognize the voice behind Jingle Bell, Jingle BAM!, its hosted by Wayne and Lenny (the elves from ABC’s Prep and Landing). The highlight of Animal Kingdom’s Christmas season is its massive icon tree located near the gates of the park. The tree is decorated with the usual lights and traditional ornaments, but you will also see a lot of interesting animal and African-themed ornaments like giraffes, hippos, lions, zebras, and drums. Other than the icon tree and a few other Christmas trees here and there, Animal Kingdom really doesn’t have a lot in the way of decorations. The reason for this may be because the park is rarely open at nighttime, so brightly lit decorations aren’t practical. All of the Disney Value and Moderate resorts decorate for the holiday season, mostly in the lobby area with ornate Christmas trees and other assorted Christmas elements to match the theme of the respective hotel. But if you are in search of extra magical Christmas touches, head to the Disney Deluxe resorts. Each of the Deluxe and DVC resorts has a lavishly decorated Christmas tree and a variety of other festive decorations. Here are some of the resorts that go above and beyond during the holiday season. If you are looking for the elegant version of a Disney World Christmas, look no further than Grand Floridian Resort & Spa. Here you will find the balconies adorned with classy Christmas decorations and the centerpiece of the lobby – a 16 foot high by 17 foot wide Victorian Christmas tree – is really a stunner. As beautiful as the decorations are, most people are drawn to the massive gingerbread house inside the hotel. Cast members spend months planning and building this gingerbread house, when complete, people from far and wide come to see the finished product. In case you were wondering, yes, it is edible and made almost entirely from natural ingredients like honey dough and glaze. Disney’s Contemporary Resort joins in the holiday spirit with 17-foot tall gingerbread tree on the concourse level and a 25-foot Mickey Mouse-shaped wreath (with an addition 18-feet of his ears) hanging from the exterior facing Magic Kingdom. The Mickey Mouse wreath is hard to miss, especially at night when wreath is aglow with lights. Disney’s Beach Club and Yacht Club resorts are two more festive Disney resort to visit during the Christmas season. Each resort is decorated with its own unique touches; Beach Club’s holiday theme is whimsical and beach-like while is full of light Yacht Club is more refined. The lobby of Beach Club features an edible carousel (no eating allowed!) and the Yacht Club lobby plays host to an enchanting Christmas village scene with a train. Wilderness Lodge celebrates the holiday in traditional American Christmas fashion. There are plenty of decorations, including festive fireplaces, balconies with garnishment, pine cones, and deer, and a large brightly lit Christmas tree in the towering lobby. The decorations – found throughout the resort – really make Wilderness Lodge stand out as one of the best Disney resorts to experience during this festive season. Like Disney Wilderness Lodge, Animal Kingdom Lodge’s soaring lobby is the perfect space for gigantic Christmas tree. And a gigantic tree they have! The Animal Kingdom tree is massive and adorned with African-inspired ornaments and garnishments. Besides the tree, you will find many Christmasy African-inspired tribal decorations which add to enchantment-level and beauty of the lodge. We hope our Christmas at Disney World page has helped you formulate your Disney holiday visit. 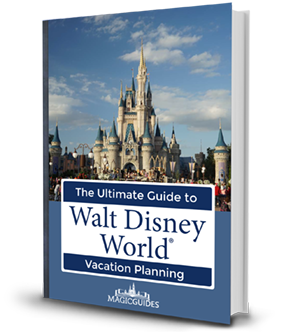 For more useful Disney World information, please review some additional pages on MagicGuides like our Epcot International Food and Wine Festival, Disney Dining Plan Calculator, Disney Transportation Map, and Disney World Tips and Tricks articles.